Our range of products include cuplock spigot. We are engaged in manufacturing and supplying Cuplock Spigot. 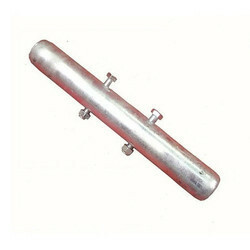 This range of products are manufactured using qualitative iron and steel alloy sourced from reliable vendor companies. Apart from this, we have appointed some of the expert quality controllers who conduct various tests on these products to deliver a defect-free array of consignments to the customers. Customers can avail this range of products in various sizes, weight and dimensions.